Added on March 10, 2019 by Betsy Johnson Welty. Added on January 9, 2019 by Betsy Johnson Welty. My painting, “Ball Jar Posies” will hang in the first show of the new year at Framed Image Gallery. Added on November 8, 2018 by Betsy Johnson Welty. Added on September 21, 2018 by Betsy Johnson Welty. I am honored to announce that I have been invited to participating in the inaugural Central City Plein Air Festival, taking place Sept. 28th, 29th and 30th! I'll be painting fall landscapes and historic architecture within a radius of the Central City Opera House for three days, along with 19 other local and national artists. The event is free to the public and visitors are invited to observe the artists and experience Central City in Autumn from an artist's perspective. The culminating art show and sale will take place on Sunday, September 30th from 5-8 pm at the Gilpin County Arts Association Washington Hall Gallery, 115 Eureka Street, directly across from the Central City Opera House. Added on September 17, 2018 by Betsy Johnson Welty. 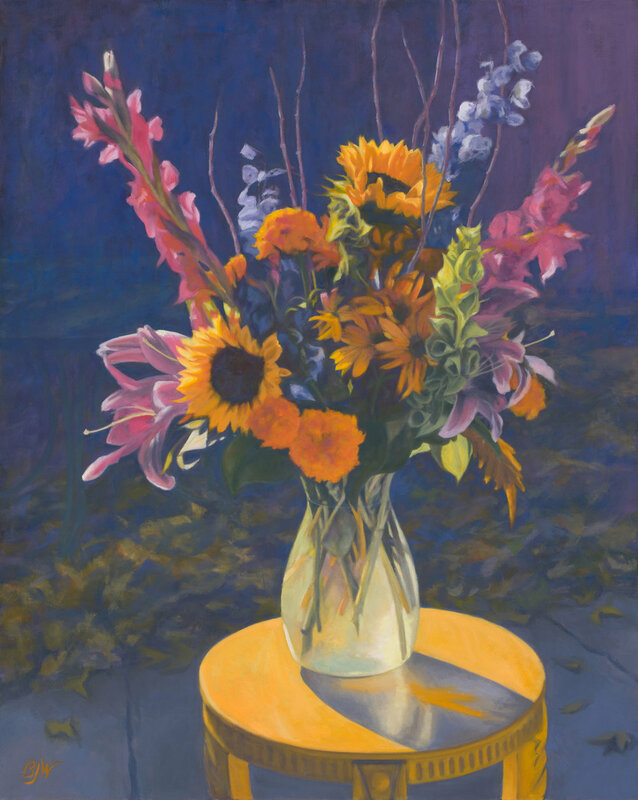 This floral painting, “Bonnie Brae Flowers,” was exploration of color compliments as well as light and shadow. I was working with the complimentary colors of purple and yellow, pushing the shadows to a blueish purple, in stark contrast to the sunlit yellow table. . The low, angular autumn light was dramatically illuminating the flower arrangement and glass vase. I had painted a smaller study of this composition in a bluer palette, and it helped me realize that I wanted to achieve more light and shadow contrast in this 30” x 24” painting. Added on September 1, 2018 by Betsy Johnson Welty. Added on August 29, 2018 by Betsy Johnson Welty. La Maison Rose or "The Pink House" is a small cafe in Paris' Montmartre, located north of the Basilica of the Sacre Coeur. A building painted by and connected to many artists, Picasso frequented the venue during his time in Paris and knew the owner, a french femme fatale named Germaine Pichot. Picasso's best friend, Carlos, was in love with Germaine, who did not return his affection. Carlos tried to shoot Germaine in an emotional rage, but ended up shooting himself. His death is said to have made Picasso become deeply depressed, and led to the start of the painter's Blue Period. Added on July 27, 2018 by Betsy Johnson Welty. I've been invited to participate in the 2018 Georgetown Plein Air, a one-day wet paint plein air paint-out on August 11th. The art exhibit and sale opens that evening from 6-8 p.m. at the Georgetown Heritage Center, 809 Taos Street, Georgetown, CO, and will hang through August 26th. Daily hours are 10 am - 4 pm. Georgetown Heritage Center, a recently restored 1874 Schoolhouse in Georgetown Colorado, will be hosting the 2018 Georgetown Plein Air art exhibit and sale. Added on May 17, 2018 by Betsy Johnson Welty. "High Line Shadows," by Betsy Johnson Welty, Oil on Canvas, 10" x 8"
Added on September 12, 2017 by Betsy Johnson Welty. I have been invited to participate in the 2017 Cherry Hills Land Preserve Barn Party, an art auction benefitting the CHLP. The CHLP mission is to preserve open lands in Cherry Hills Village through leadership, stewardship, advocacy, and education. My painting, "High Line Shadows," is one of four paintings I have in the show. This painting portrays the High Line Canal, a historic trail and irrigation ditch, that winds through Cherry Hills Village and links many open spaces in the Village. Grand old cottonwood trees grow along the canal and turn gold in the Fall, providing a riot of color.